The twelfth annual Animation Block Party is July 30- August 2, 2015 at Rooftop Films and BAMcinématek. Tickets are on sale at doors to each event, but you can also buy in advance at links below. Weekend Passes can be picked up at ABP merchandise tables at all venues. Animation Block Party Opening Night at Rooftop Films is Presented by Arts Brookfield. The ABP 2015 festival begins on Thursday, July 30th at Brookfield Place (formerly the World Financial Center) ground level, along the water between West Street and the Hudson River - 220 Vesey Street, NY, NY, 10281. Doors at 6:30pm. Live Music at 7:45 pm. Films begin at 8:45pm. Screening is free and open to the public. In the event of rain, show will be indoors at same location. Animation Block Party presents a diverse compilation of extraordinary animated shorts, including exclusives from DreamWorks TV and Nickelodeon. Animation Block Party continues on Friday, July 31th at BAMcinématek located at the Peter Sharp Building, 30 Lafayette Avenue in Brooklyn, NY 11217. ABP Friday at BAMcinématek features four animation programs. The 2pm slot offers a screening of Narrative Works, Studio Shorts and Local Films. At 4pm, there will be a screening of Student Films and Independent Animators. 7pm show features Eyeworks Animation favorites. At 9:30pm, there will be a 20th Anniversary screening of Ghost in the Shell. Animation Block Party presents a collection of imaginative films by students and independent animators. *post-screening Q&A with festival co-founder, Alexander Stewart. Celebrate the 20th anniversary of this dazzling science-fiction mind-bender, a landmark of Japanese animation (and a major influence on The Matrix). Set in the digital dystopia of 2029, it follows a female cyborg cop on a mission to track down a rogue hacker known as the Puppet Master, raising provocative philosophical questions about what it means to be human and offering an optic-overload of retro-futuristic visual poetry. 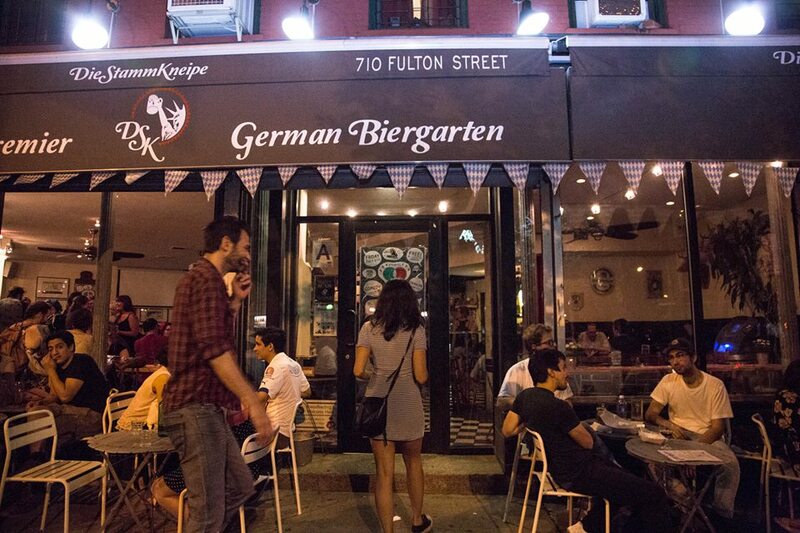 Die StammKneipe(DSK) located at 710 Fulton Street, Brooklyn NY 11217. Animation Block Party continues on Saturday, August 1st at BAMcinématek located at the Peter Sharp Building, 30 Lafayette Avenue, Brooklyn NY 11217. ABP Saturday at BAMcinématek four animation programs. The 2pm slot is a special Animation for Kids screening. At 4:30pm, there will be a screening of Pre Code Hollywood cartoons. The 7pm show features International Shorts. At 9pm, there will be a JibJab Showcase. Animation curator and collector Tom Stathes presents this special screening of ultra rare Pre-Code Hollywood cartoons. *post-screening Q&A with Tommy Stathes and J.J. Sedelmaier. Animation Block Party presents a blend of the best animated shorts from around the world. The first of two entirely unique programs of acclaimed international animated films. Evan and Gregg Spiridellis founded JibJab in a Brooklyn garage nearly sixteen years ago. This summer, Animation Block Party will be presenting an exclusive JibJab Anniversary show at BAMcinématek, featuring everything from Presidential rap battles to "year in review" YouTube hits. *screening to be followed by a Q&A with JibJab co-founder Evan Spiridellis and showcase will also include assorted JibJab E-Cards. BAM Fisher located at 321 Ashland Pl, Brooklyn NY 11217. Arcade games, air hockey, foosball, pop-shot basketball, ping pong, streaming cartoons, music, Sakura Art Drawing Wall, Brooklyn Brewery Beer, Deep River Snacks chips, and much more! Animation Block Party concludes on Sunday, July 27th at BAMcinématek, 30 Lafayette Avenue, Brooklyn NY 11217. At 2pm, there will be a Sesame Street Retrospective. The 4:30pm show is a 35mm screening of the Care Bears Movie. The 7pm show is a second original program of International Shorts. At 9pm, there will be a screening of Experimental Films, Graphic Design and Music Videos. *Screening features a Q&A with Sesame Producer Kim Wright and animators Joey Ahlbum, Jeremy Galante, David Cowles and Mari Jaye Blanchard. The cuddly, rainbow-colored plush creatures journey from their cloud kingdom of Care-a-Lot to Earth to the Forest of Feelings on a quest to help a pair of orphans and save the world from an evil spirit. A surprise box office smash, this sunshiny adventure features voice work by Mickey Rooney and Harry Dean Stanton and songs by Carole King, Tower of Power, and John Sebastian (The Lovin’ Spoonful).